I don't usually love the travel coverage in the NY Times, but this story, Traveling in Southeast Asia With a Rock-Star Baby, is great. 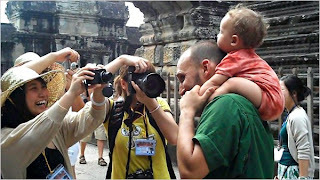 It's not going to tell you where to go and what to do, but it should give you the confidence (and motivation) to take your baby to Southeast Asia. It makes me (almost) want to have a baby just so I can go and see for myself.